Miron Livny, director of the Core Computational Technology research group shared by WID and the Morgridge Institute for Research, and a University of Wisconsin–Madison computer sciences professor, has been honored for his groundbreaking contributions to the field with the 2013 High Performance Parallel and Distributed Computing (HPDC) Achievement Award. The analysis of innovative HPDC systems or applications including components. Livny recently accepted the award at the 22nd annual Association for Computing Machinery’s HPDC conference in New York. 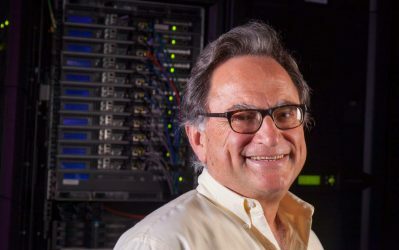 As the director of the UW–Madison Center for High Throughput Computing and principal investigator of the Open Science Grid, Livny continues to advance and promote the adoption of high throughput computing technologies. A recent award by the Department of Homeland Security’s Science and Technology Directorate to a team led by the Morgridge Institute for Research to build and operate a national software assurance marketplace will enhance the ability of the open-source software tools that harness computing resources located on campuses and institutions throughout the U.S. to accelerate scientific discovery.